It looks like I will be the last person on earth to smell Arquiste Él and Ella. 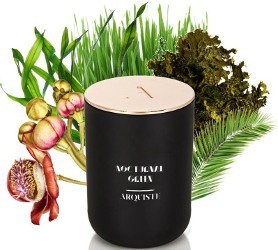 All the more reason I need Arquiste's Nocturnal Green candle: "A jungly, earthy and green candle inspired by the nighttime gardens of 1970s jet-set Acapulco, the glamorous setting behind ÉL and ELLA eaux de parfum." $85 at Beautyhabit. You and I both, even though I like his line and these both sound like things I would love. Sometimes I wait so long that I’d rather not try something in case it’s just a let down! But I do want that candle. This is my lemming too, especially because I did smell Ella and it jumped right onto my “to buy” list! The candle must be amazing too. I really like Arquiste, the concept, the aesthetics, the fragrances. Awesome! I’ll have to figure out where I can smell this in person. I like Ella, but I can’t really tell if it’s “me” yet. I’ll have to do a better road test of it once the weather gets cooler. I am sure I’ll never smell one in person, so do report back if you do! Do you need a sample Robin?